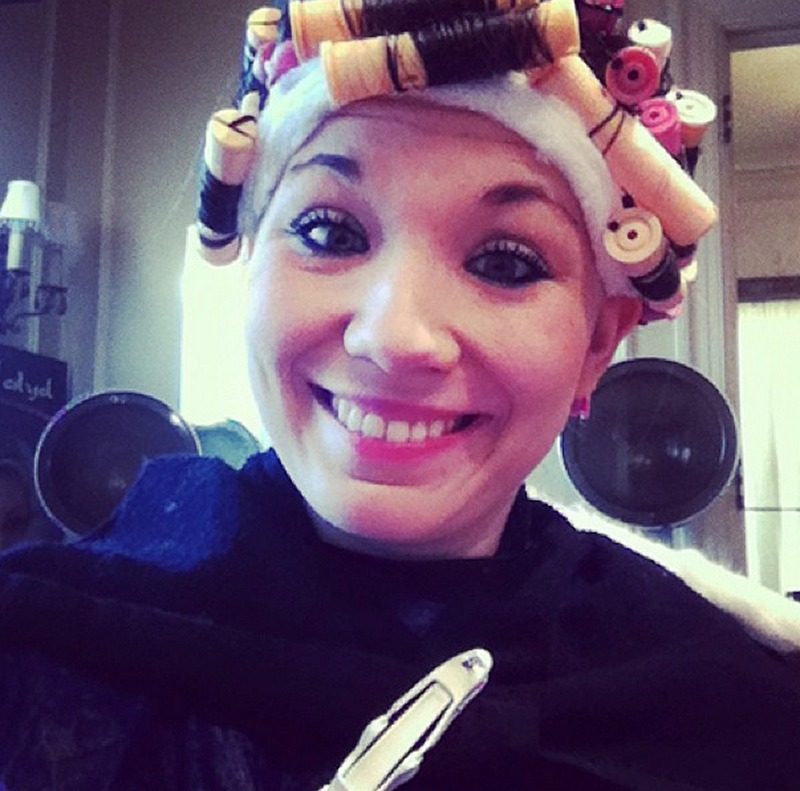 What if someone doubts it is a perm, she can now show this photos as proof? I am glad to have read something from some of you, thanks. I used to dream about getting a perm done, sitting in a chair with a nice cape (or even 2, such a transparant on top) being wound in permrods etc… and yes such dreams aroused me like crazy. As you can read on this blog, I went from fantasy to reality and in reality you have to take things as they come. From a dream I still like those spiralwinds, with lots and lots of rods, and maybe a wetset too. Or piggy-back-wind or maybe a air-neutralized perm ( then you are in permrods for 24 hours or more), oh boy so many possibilities. I hope that all of you can follow your dream as I did. I think almost all of my perms had a processing time of 20 ( maybe 25 ) minutes. Four perms where done using a black permcap and a towel over the cap, the rest using no cap and a overhead climasun-heater-unit. A perm(neck)tray was used in two perms. Classic hoodhairdryers are not very common in salons anymore, the climasununits can be used more ways: processing with perms or color, drying the hair faster or for wetsets. I also think they are a bit more comfortable because with a classic hooddryer one is enclosed in a smaller space, less room to move around. Please keep sending me more questions to ask. I was at a salon a few times. And again on Tuesday 7th September 2010. I entered the salon and noticed ome 4 people where waiting, ahwell I had time enough. After some 10 minutes of waiting one stylist came and asked who was next and which styliste he/she wants. That way all 4 people where divided and hey could go to their favourite stylists to wait in the chair there ( because all stylists where still busy on the other chair, all stylist have 2 chairs to work with), then she asked me “For a perm?”.. “no ” I replied “ok, so you have don’t need a particulair stylist?” “no, I am ok with all”, I replied. I have found that in this salon all stylists are very well trained and to me it doesn’t matter that much who does my hair, I do prefer the one windowseat ( but that was allready taken) and some stylists do some small things with a perm differently then others, but the result is always good. So today I got a new stylist, Diana, she works very close to the waiting area. The boths chairs at the wall , left in the back. I was in the first of the two, so less close to the waiting area then on 28th Mai 2010. She asked what I wanted done, so I said “cut off some 1 cm overall except in the front , there a bit less please” . She asked if I wanted it washed before, I replied “yes, please”. So Firstly I got a good washing and then she cut my hair , or better trimmed it. Oh boy, it went very curly again. After the cut some mousse was applied and I spend some 20 minutes under a Climasun. My perm looked like “new” … I loved it. Yes , Go Girl.. get a perm and enjoy… and she does.. see her smiling… I wish I could have seen her smile after she has seen her curlylooks. This month’s theme was/is “Dreams”, a thing that all of (hair)fetish-people share are dreams, we dream about certain things happening.. but sometimes one take control and take a “dream” / fantasy to reality… as I did. Wednesday 7th July 2010 I went to my favourite Salon, the shop called Cut And Go. Since I planned a perm today, I was around 14:00 there. It was not a busy day at the Salon, and soon it was my turn. Today my stylist was Anna, she allready permed me twice. Today I was seated on a chair with the back to the waiting area. I had my camera with me that day because there was a nice fair in the city , I mad this photo after I returned from the fair. My chair for that day was the one not shown in the photo but on the backside of the “island” in the right of the photo. I sat down and she asked “What can we do today?” , “my curls need to be redone” I replied.. “ah yes, a perm can I see your card? ” .. I showed her the card where they write about how perms have been done.. what rods, solution and time etc. She asked me to go to the washingarea. After she returned she first put a towel over my shoulders and made a knot in the front so it would stay there, now she had the cotton in her hand and some creme… the creme she applied there where the cotton would go… during this the cotton was lying on the towel in my neck.. she then took the cotton to put around my face etc and some of the cotton got stuck in towel… she had to remove those bits.. looked a bit funny. She put the cotton around my head and took the bottle of permfluid and started applying it… oh boy does that smell nice and it feels a bit cold too. Then she got hold of the mobile silver climasununit and I was put under it for 25 minutes. I went to the washingplace where Anna allread was waiting, she then rinsed out my hair for some 10 minutes and warned me about how cold the neutralizer is… and boy is that cold. But boy what a joy.. more time in permrods.. after she applied all the foam she asked me to lean a bit forward and she put a towel between me and the sink, because lying for such a long time in a hard sink kind hurts a bit. This neutralizer had to “work” for some 15 minutes orso.. I always try to sit more upright then, and watch what is going on in the salon… today not much, but it’s also fun to see how people re-act to me. After a 15 min wait Anna returned and rinsed out the foam and removed the rods , after that a bit more neutralizer was used and rinsed out again before some condinioer is put in my hair. Now it’s cutting time. 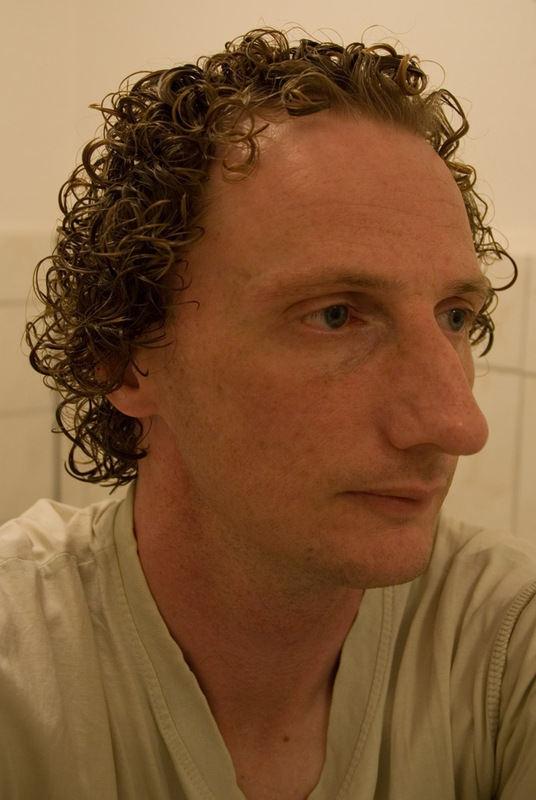 We returned to “my” place and the curls looked nice agai She asked how much to cut, and 1 cm should be enough I said. She put my hair in the back uo using some clippers and stretched it down.. my hair there is really long, but I love it.. due to the perm it looks so much shorter then it really is. In the front she cut even less then 1 cm.. after this cut some mousse was applied and I had to dry under a climasununit.. I was very happy again with the whole proces, and for such a bargain… only € 29 for 2 hours of fun in the salon.. and a suburb hairdo, we can’t complain. I even left Anna a small tipp in her little Animal-bank. So how did I look? That photo was taking and the later evening when I was back here again. 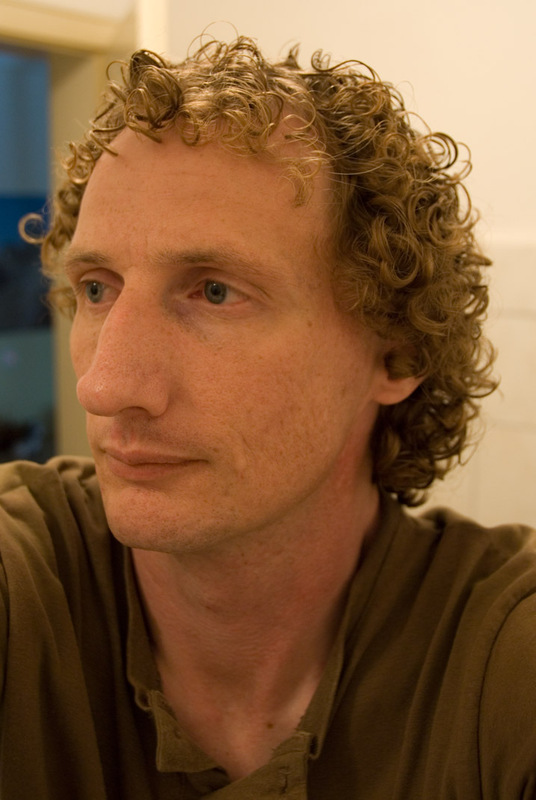 As usual a perm is very tight in it’s first weeks… so now how I look today. I still find this perm a bit too tight, and my next perm I will let them use or all Gray perm rods, or an alternating a pattern using gray and blue. I hope some of you ( or all of you) enjoy reading this about as much as I did doing it…. some dreams one has to follow… because you can regret not only the things you do but also the things you didn’t do. Thanks all for visiting my blog so often. Today I made a choice to go to “my” Salon, the local Cut & Go… and as he name of the Salon says… it was Cut & Go-time. Normally I first walk by the side with the huge windows to peek inside what is going on, this time I came from the other side and directly went in. I opend the door and smellt a perm being done, I look in the back and saw an elderly woman being permwound on red rods, but close to me there was a woman “baking” under a climasun with blue-rods ( like my perms), I hung my coat away and seated in the waiting area, 4 woman where waiting. I look through the salon and at the first washingstation and younger woman was being neutralized of a perm on blue rods, I must have hit the “Jackpot” today… 3 perms being done, oh boy. Yes that did exited me very much. I had to wait sometime this time but with a room filled with permsmell, and I could look directly to 2 woman getting a perm… why does time go so fast? After some 20 minutes of waiting it was myturn, this styliste cut my hair once before, today she was working on a chair on the right outside of the photo, normally an other styliste works there but she was on holiday. This chair is next to the waitingarea and the little room where he stylists go for a snack etc. We walked to her chair and before I sat down, she asked “A perm?” … “well no” I responded, “ah ok, then a cut with wash?”. “Yes” I replied. She directed me to the washingarea, the first bassin ( so the one where a neutralizing was done just minues before), she put a blue towel over my shoulders and I leaned back. She washed my hair twice and put a towel over it, back to the styling chair. She drapped a nice dark blue cape on me, and asked “Cut about 2 cm?” , and showed it with her hands. I said “no less please , or is my hair so bad?” .. “No” she said “We can do less” … So we went for 1 cm. Why so less? Well I really like my hair longer, the last styliste that permed me some 10 weeks back kinda cut away a bit much.. she does her job well but I rather have longer hair ( now it’s still possible). Tanja ( I saw her name on the mobile-permroller-tray) and later on the “bill”, used some clipper to keep my hair up and started in the back. When shes strechtes my hair down to cut it it goes below my shoulders, offcourse with the effect of the perm / curls it “looks” shorter. She did a very nice cut, we didn’t talk very much.. I didn’t feel very comfortable so close to the waitingarea. She even cut in front even less then 1 cm, which I totally love because there I like it long, sometimes those hairs can touch the tipp of my nose. The cut didn’t took very long in time. She asked “Some mouse in it, and under a dryer?” .. I said “yes please, that would be nice” . So she put some mouse in my hair, the kind they use has a smell like flowers etc.. I love it, then she went away to get the silver mobile climasununit and clicked it on. I spend at least 15 minutes under it and played a few Soduko’s on my Nintendo DS. My curls looked super again. We went to the cashregister and I paid her € 10,- .. Since I now had 10 payslips from this Salon I could get a € 5,- refund.. I gave her those, she counted them and I got € 5,- returnd. I left a small tipp for Tanja. I always love it there at the Salon, later I noticed the names of some of the stylists there: Anna, Sandra ( now even 2), Diana , Tanja… all end on a “a” and even more fun a person that I have met over this and who I really like also has a name that ends on “a” … live is full of nice things, isn’t? So I made my hair “ready” for an upcoming perm, which will be something special… just hang on to this blog, or perhaps chat with me on yahoo-messenger to know more about it. Yesterday I went to my favourite Salon called Cut and Go for a perm. Around 13:00 I was at the salon and it seems a busy day, in the waitingarea where 6 people waiting. But then I noticed that one woman with child was waiting for a stylist that was not working today, an other person left as soon as his partner was ready and then one 2 where left. Me and a woman. So when Beate came from her lunchbreak we went to her chair, yes the one between the windows.. I sat down and she said “A perm, yes?” , “yes indeed” I replied. She put a towel over my shoulders and used a black cape, then we went to the washingplace. After my hair was washed twice we returned to the stylingchair. She asked “what kind of permrods?” , I said “blue withe some gray’s to give a more natural look” , “yes” she said “that looks nicer, and cut away only the ends?” .. “Yes I said not that much”. She decided to cut first and after that to perm. I asked her about the new stylist, she was indeed “new”, she replaced an other woman that changed her job to an other city closer to where she lives. 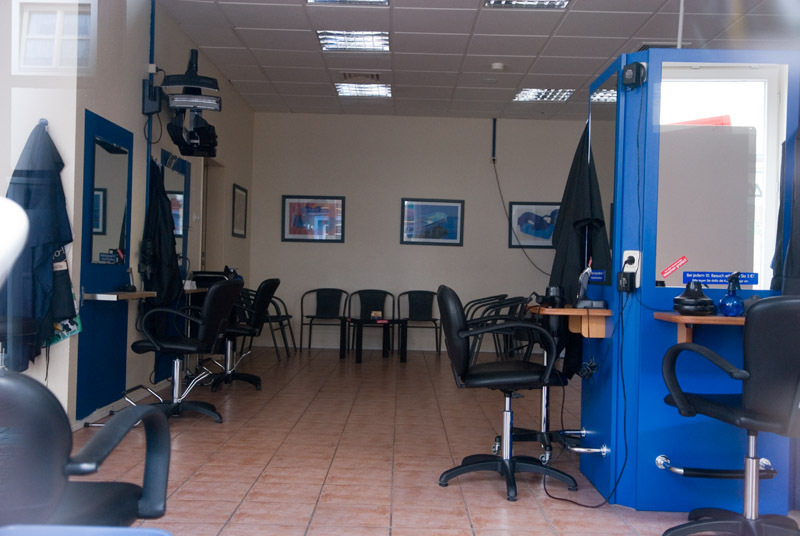 This Salon is one of a chain withe several Salons between Hanover and Kassel in Germany. 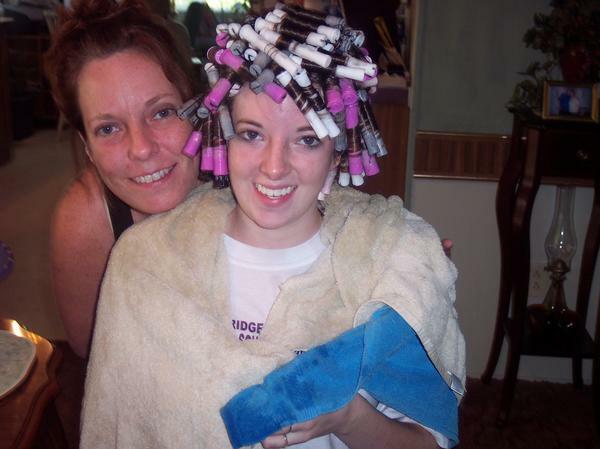 After the cut she started with the permwind, in total 53 permrods where put in my hair, most blue and on the crown some blue/gray’s. I love her chair because you can look outside but it’s also nice to see my own back since directly behind is an othe stylingchair so I could see the permrods in from behind aswell… mmmm feels so nice. After the permfluid was applied I had to “bake” under a silver color Climsununit… watching myself this way, feeling the permrods… sooo nice. After some 25 minutes the climasun went away and back to washingplace again, to rinse out the permfluid. This hurts a bit since you have to lie in the sink for some time and there are permrods between your neck and the hard washingplace. After some rinsing with warm water the neutralizer feels like “ice” brrr. How cold is that, she warned me before putting it on ( I laughed a bit because I knew it allready) but it still is a “shock” , then this neutralizerfoam has to “work” for some 10 minutes. During that time I always sit normal instead of lying because I like to look around in the salon, now an elderly woman was getting a wetset. After the neutralizer was done my hair was rinsed again an the permrods removed, I felt the tension on my head/hair go away and offcourse the weight of the rods. Some extra rinsing and some conditioner and back to the stylingchair. Since she had had started with the cut now she only had “play” a bit with the new curls put some mousse in it and let it dry under the climasun. Shortly before 16:00 my hair was dry. I paid € 29,- and left a tip. This was my 19th visit to a salon of Cut & Go, I know the because if you have 10 payingstrips you get € 5 refunded, I once had 10 and now I have 9 so next time will be € 5,- cheaper. Why is this a “milestone” ? Well it was/is my “sweet” 16th perm. Today I went to my favourite salon from Cut and Go for a perm (or Dauerwelle in German), my 15th perm ever. I arrived at the salon 12:30 orso, it was not a busy day. I had to wait some 20 minutes, but that was no problem. A young woman came and asked “for who are you waiting?” ( this salon works on a walk-in-basis you can’t reserve a time / stylist, but offcourse you wait longer for the one you want if you wish), to me it doesn’t matter all that much all stylists there are well trained woman that can do everything very well. So I told her “I am waiting for you?” , infact I kinda was hoping in advance she was there today. She allready permed me once there, and one time just a cut. She put a towel over my shoulders and after I leand back she make my hair wet and askes if the temperature was ok, it was nice warm so I said “everything ok”. She washed my hair and rinsed out all the shampoo using a towel dried my hair a bit and left the towel on my head, we went back to the chair. There she put a nice dark blue cape on me and went away to get the permrods etc. She came back with lots of permrods, she was going to use red/blue ones on top and blue ones for the rest. red/blue are with 10 mm a little bit tighter then blue which are 11 mm . In total 49 permrods where used. She asked during the winding “Is it too tight?” , well yes you can feel it it but I kinda like that feeling so I replied “no not a problem”, after the wind was completed which took some 30 minutes she use permrodsticks to keep the rods together, then it felt even more tight. She went away for the permfluid and returend with a lot of cotton, yes I always love that. she used some creme around my face and drapped the cotton in place, after that she started applying the fluid. It felt cold, and I still love the smell of it. After the fluid was all put on the rods a mobile climasun was lowered on me and I had to sit and wait for > 20 minutes, what a drag. 😉 During the time I had to sit under the climasun I could see the other perm being done, that woman was coming back from the washingbowl with some very nice curls. Then the Climasun made a “PIEP” and Anna returned to look at how the curls are, she unwinded 2 rods and she was satisfied so she directed me to the washingbowl. First she rinsed out the permfluids, that part always hurts a bit in the neck laying in washingbowl for 5 minutes or more and permrods between you and the washingbowl. The water was nice warm, then she was going to put the neutralizer in, she warned me that it could be cold, and it is…. but I kinda like all of this, feeling the permrods etc. After she was done with the neutralizer she put an extra towel between me and the washingbowl, that was a good feeling. I had to wait again, perms take a long time. 😉 But every minute is fun. I always look around the salon then, but today was not a busy day. The neutralizer was done so it could be rinsed out. Then all the 49 rods where removed , I felt my head losing a lot “weight” , again some neutralizer in my hair again some rinsing and after that some condioner (always good for your hair), back to the stylingchair. I just wanted to loose the deadends, so about 1 cm was cut off. Wow did these curls look curly. But that always with a fresh perm, a perm looks it’s best after 1-2 weeks. My hair was dried under a climasun with some mouse applied to it. Next salonvisit?, perhaps end of December or maybe early January. Next perm? most likely mid February 2010.